Going along with the updates to their Venue tablets, which we just posted about, yesterday Dell also announced updates to their XPS line of laptops. There are three new XPS models to cover, all with Haswell processors and all with new designs relative to last year’s models. What will be particularly interesting is the use of ultra-high resolution panels on two of the models, with resolutions that match or in the case of the XPS 15 even surpass the MacBook Retina displays. Checking in with the ultrathin Ultrabook category is the new XPS 11, which apparently takes over as a hybrid device for the outgoing XPS 12 Duo. The design is highly reminiscent of the Lenovo Yoga, with the hinge allowing 360 degrees of travel so that you can flip the screen around to turn your laptop into a tablet. This requires fewer moving parts than the XPS 12, but at the same time it leaves the keyboard exposed when you’re in tablet mode. Dell’s solution is to use a solid surface keyboard – as in, no key travel apparently. I’m not sure how that will feel, but it’s one possible answer to the hybrid device conundrum. Dell also uses premium materials with a combination of machined aluminum and carbon fiber for the chassis and a silicone palm rest. Processor options consist of Intel’s Y-series of Haswell CPUs: Core i3-4020Y (1.5GHz dual-core, HD Graphics 4200), Core i5-4210Y (1.5-1.9GHz dual-core, HD Graphics 4200), and Core i5-4300Y (1.6-2.3GHz dual-core, HD Graphics 4200) – those are all 11.5W TDP, 6W SDP (Scenario Design Power) parts. Interestingly, those are the same CPU options as the Haswell-based Dell Venue Pro 11 tablet, minus the Bay Trail Z3770 and the Haswell Pentium 3560Y. Memory is limited to 4GB dual-channel DDR3L-RS 1600MHz onboard, with no option to upgrade. Storage will be pure SSD, with 80GB, 128GB, or 256GB drives available. Perhaps most interesting will be the display, a QHD (2560x1440) 11.6” IPS touchscreen boasting 400-nit brightness and a 72% color gamut with an 800:1 contrast ratio. That’s essentially the same resolution as the MacBook Pro 13 Retina, but sadly with a 16:9 aspect ratio instead of 16:10, and in an 11.6” size instead of 13.3”. Needless to say, you won’t want to run at native resolution without scaling, but the ultra fine DPI should allow for the use of other resolutions without problem, or there’s always 1280x720 with pixel doubling. It will be interesting to see how Microsoft handles the scaling question in comparison to OS X; Apple chose to render lower non-native resolutions at 2x and then use supersampling to fit them to the available resolution, while “native” handled text and images differently. Windows 8.1 is not doing any supersampling that I’m aware of, so I’m not sure what non-native content will look like. The panel is also protected by Gorilla Glass NBT, Corning’s latest that promises to be even more durable. The remaining specs include a 40Wh battery (no word yet on battery life), backlit keyboard, Intel Wireless-AC 7260 WiFi with Bluetooth 4.0, NFC, and an HD webcam. IO ports consist of two USB 3.0 with PowerShare, an HDMI port, a headset combo jack, and an SD/SDIO/SDXC card reader. The XPS 11 is extremely thin, no doubt helped by the lack of key travel on the keyboard, measuring 30mm x 201mm x 11-15mm (11.8” x 7.9” x 0.4-0.6”), with a weight of 1.13kg (2.5 lbs). Availability is scheduled for November, with a starting price of $1000. Next up is the XPS 13, which appears to be largely the same as the XPS 13 we reviewed earlier this year, only now with Haswell processor options. Dell claims that they’ve fit a 13.3” display into a chassis that’s nearly the same size as 11.6” Ultrabooks, and compared to the above XPS 11 that’s pretty accurate – the XPS 13 measures 316mm x 205mm x 6-18mm (12.4” x 8.1” x 0.2-0.7”), so it’s about half an inch wider and a quarter inch deeper. The cynic in me would of course point out that there’s still an awful lot of bezel on the top and bottom of the display, and while it’s great that the XPS 13 is nearly the same size as the XPS 11, that means that the XPS 11 is going to have even more bezel real estate by comparison. (If you’re curious about the math, the diagonal of the XPS 13 is 14.8” while the diagonal of the XPS 11 is 14.2”, so 1.6” of bezel diagonal vs. 2.6” of bezel diagonal.) The chassis of the XPS 13 is machined aluminum with carbon fiber on the bottom, and a magnesium alloy palm rest with soft touch paint. Moving over to the internal components, the XPS 13 uses Intel’s U-series Haswell processors, with four choices: Core i3-4010U (1.7GHz dual-core, 15W), Core i5-4200U (1.6-2.6GHz dual-core, 15W), Core i7-4500U (1.8-3.0GHz dual-core, 15W), and the Core i7-4650U (1.7-3.3GHz dual-core, 15W). The first three options all use a GT2 HD 4400 GPU with 20 EUs, while the i7-4650U sports a GT3 HD 5000 40 EU iGPU. Of course, the 15W TDP is still going to put a serious crimp on the graphics performance, so don’t expect any miracles. Dell also notes that the i7-4650U is only available on the LE model, which is apparently a higher spec variant of the XPS 13. Most of the remaining items are going to be unchanged from the XPS 13 from earlier this year – 4GB or 8GB RAM, 128GB or 256GB SSD, 55Wh 6-cell battery, 45W AC adapter, a backlit spill-resistant keyboard, two USB 3.0 ports with PowerShare, mini-DisplayPort, and a headset combo jack. 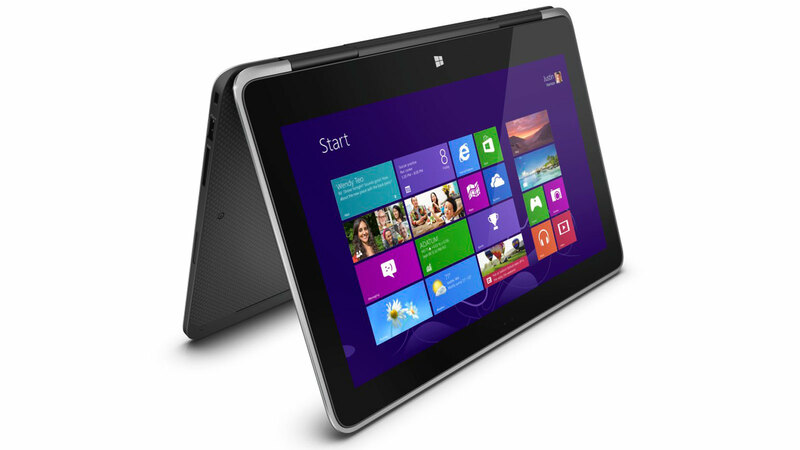 Dell does upgrade the WiFi to Intel’s Advanced-AC 7260 with Bluetooth 4.0. The screen is also unchanged, though we were quite happy with the 1920x1080 IPS touchscreen already so no complaints there. Dell states that the new model will deliver better battery life, which is expected thanks to Haswell, but we don’t know precisely what level of battery life we’ll get yet. Availability on the new XPS 13 is also scheduled for November, with pricing starting at $1000. 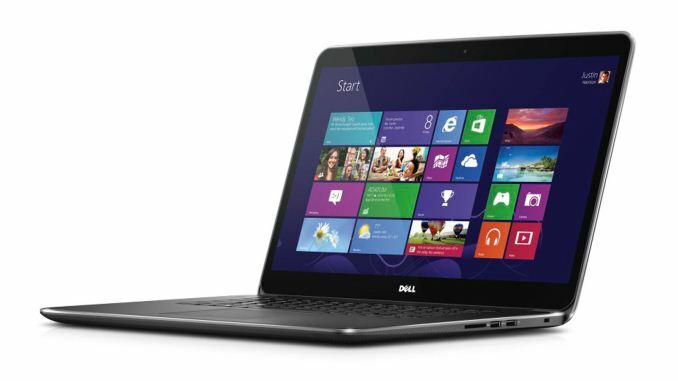 Last but certainly not least is the new XPS 15, and this one is a doozy! There will be two display options on the XPS 15, a 15.6” 1920x1080 touchscreen (nice, but…) or a 15.6” QHD+ 3200x1800 touchscreen is available as an upgrade (I believe both are IPS, but Dell doesn’t specifically say). As with the XPS 11, running native without scaling isn’t likely to result in a great experience unless you have uber-vision, but the extremely fine DPI should make other resolutions work nicely as well, with 1600x900 being exactly doubled in both dimensions. Other than the display, this is basically a scaled up version of the XPS 13 with a few tweaks. It has a machined aluminum chassis and carbon fiber base, but it gets the silicone palm rest and Gorilla Glass NBT of the XPS 11. On the performance side of the spectrum, the XPS 15 also gets scaled up. 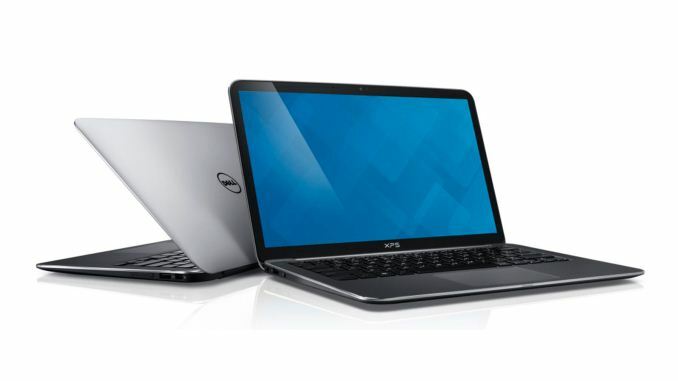 Dell offers two CPU options: the i5-4200H (2.8-3.4GHz dual-core, 47W TDP, HD Graphics 4600) or the i7-4702HQ (2.2-3.2GHz quad-core, 37W TDP, HD Graphics 4600). And no, you’re not going crazy: the quad-core part is a lower TDP than the dual-core part, but Dell makes up for it by including a GeForce GT 750M 2GB GDDR5 with the quad-core configuration. Memory is either 8GB or 16GB of DDR3L-1600 SO-DIMMs, and storage options include 500GB or 1TB HDD + 32GB SSD cache (Intel SRT), or a 512GB pure SSD configuration. With a larger chassis that measures 372mm x 254mm x 8-18mm (14.6” x 10” x 0.3-0.7”) and a weight of 2.01kg (4.44 lbs. ), there’s also more room for expansion ports. The XPS 15 has three USB 3.0 ports and one USB 2.0 port (all with PowerShare), a mini-DisplayPort, full-size HDMI, Gigabit Ethernet, headset combo jack, and SD/SDIO/SDXC reader. As with the other two XPS laptops, Waves MaxxAudio Pro helps with the speakers and sound. 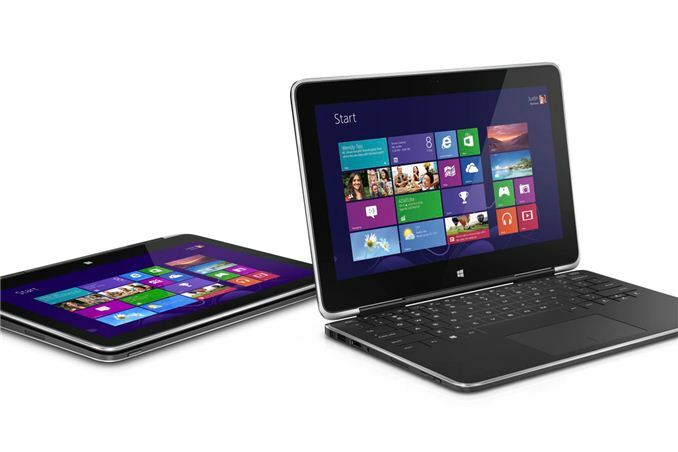 The keyboard is backlit and spill-resistant, and the touchpad has a glass surface with the usual gesture support. Intel’s Advanced-AC 7260 is also present for WiFi duties, with Bluetooth 4.0 support, and that means the XPS 15 (and 11 and 13) are now WiDi 3.0 ready; NFC support is also present, and TPM support is available on all of the new XPS models to make them “IT friendly”. Interestingly, the battery is a 61Wh built-in unit, and if you get the 512GB SSD configuration you also get a larger 91Wh built-in battery. Presumably that means the SSD is mSATA or M.2, and with no 2.5” HDD the extra room is used for additional battery cells. Unlike the other two XPS models above, the XPS 15 will go on sale October 18, with a starting price of $1500. Of course what we really want know is how much the model with the QHD+ display and 512GB SSD will cost; I suspect it will give Apple’s MacBook Pro 15 Retina a run for the money, but hopefully Dell will stay south of $2000. It's IGZO, so it uses as little as 37% as much power as traditional displays. It probably uses less than what a 720p IPS would use. Windows 8.1 improves the display scaling in Windows. This is why Dell is waiting until 8.1 to release these, even though we've known about them for months. From what I can gather IGZO is just an alternative to silicon for making the transistors in an LCD. That appears to be unrelated to how the liquid crystals themselves are oriented (eg TN, VA, IPS); but in all the mentions in reviews/etc put IGZO as an equivalent type designator to IPS, etc. IGZO transistors have very low power in their off state, hence the power savings vs traditional SI-based LCDs. Aw crap I totally misunderstood what you meant. You can't keep everyone happy it seems, always something to complain. I have various displays in use, anywhere from 768p, 900p & 1080p @ 11.6", 1080p @ 17,21, 24" all the way to a 1600p @ 30" that I been gaming on for the past 5 years. I am always a sucker for high resolution screen, and will never complain if the technology is increasing display resolution. if the price/power consumption/weight are too much for you, just buy something else or wait it out for 1 or 2 generations. Although I agree that 1440p @ 11.6" is overkill for now(and I have better than 20/20 vision), If you really want to save some GPU power, 720p is still square pixel re-scaling. While re-scaled 1080p should look OK too. With the option of 1440p when looking at pictures, 4k content, etc. Backlighting load should be resolution independent for the most part.